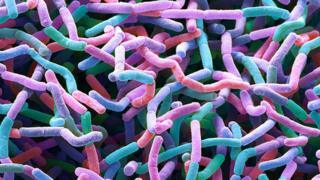 US scientists have discovered a new family of antibiotics in soil samples. The natural compounds could be used to combat hard-to-treat infections, the team at Rockefeller University hopes. Tests show the compounds, called malacidins, annihilate several bacterial diseases that have become resistant to most existing antibiotics, including the superbug MRSA. Experts say the work, published in Nature Microbiology, offers fresh hope in the antibiotics arms race. Drug-resistant diseases are one of the biggest threats to global health. They kill around 700,000 people a year, and new treatments are urgently needed. Soil is teeming with millions of different micro-organisms that produce lots of potentially therapeutic compounds, including new antibiotics. Dr Sean Brady's team at New York's Rockefeller University has been busy unearthing them. They used a gene sequencing technique to analyse more than 1,000 soil samples taken from across the US. When they discovered malacidins in many of the samples, they had a hunch it was an important find. They tested the compound on rats that they had given MRSA and it eliminated the infection in skin wounds. The researchers are now working to improve the drug's effectiveness in the hope that it can be developed into a real treatment for people. Dr Brady said: "It is impossible to say when, or even if, an early stage antibiotic discovery like the malacidins will proceed to the clinic. "It is a long, arduous road from the initial discovery of an antibiotic to a clinically used entity." Prof Colin Garner, from Antibiotic Research UK, said finding new antibiotics to treat gram-positive infections like MRSA was good news, but would not address the most pressing need. "Our concern are the so called gram-negative bacteria which are difficult to treat and where resistance is on the increase," he said. "Gram-negative bacteria cause pneumonia, blood and urinary tract infections as skin infections. We need new antibiotics to treat this class."